Nuevas arquitecturas o una rara insistencia para entender la noche (New Architectures or a Rare Insistence on Understanding the Night), 1999–2001, Japanese paper with lights, wood, and wire. Courtesy of the artist and Lombard-Freid Fine Arts. I met Carlos Garaicoa in 1994, when I traveled to Havana for the Bienal. It was the first studio visit that I had ever made at midnight—this was Havana, and why not? Garaicoa was one of the artists showing me his work in a group studio of photographers, which was in a walk-up edificio, a makeshift loft on the Malecón with a great view of the sea. Garaicoa has had a huge impact on me, not only as an artist but now as a friend who has contributed greatly to my understanding of the island and the “Cuban way of life.” In 1996 I selected him for a residency at Art in General, where he created a new body of work, When a Desire Resembles Nothing , which illustrated various relationships between New York and Havana. At the time, when Garaicoa was producing this work, very few people were aware that New York and Havana had anything in common. He collected objects and documented them as they traveled between both locations creating a series of installations, photographs and drawings highlighting the parallels and ironies of both cities. I had the opportunity to speak to Garaicoa about his most recent work via email. The following interview took place in August and September after he returned to Havana from Documenta 11. Aquí­ construye… (Here builds…) (detail), 1993, black-and-white photograph, 7 x 9½”, ink drawing on vegetable paper, 27½ x 19¾”, wood and metal plate. Courtesy of the artist and Lombard-Freid Fine Arts. Holly Block Carlos, you were just included in Documenta 11 in Kassel, Germany. Can you describe your project for the show and your process for making it? Where was this work created and for what audience? How is it different from your previous projects? And how does living in Cuba affect your work? Carlos Garaicoa Continuidad de una arquitectura ajena (Continuity of Somebody’s Architecture), 2002, has visible points of contact with the conceptual base of the work I’ve been doing in the last ten years. It manifests references to architecture; the reconstruction of places and things by means of fiction (that is, by developing new projects and architectural inventions); the evidencing of attitudes and political projects; the existential and experiential crises of human beings; and how fiction unsettles history, reinventing it and somehow rewriting it. For Continuity of Somebody’s Architecture I decided to distance myself from the traditional assumptions of art and to substitute them with a quasi-multidisciplinary reflection that has placed me nearer to the compromises and roles associated with architecture. In this reflection I tried to understand architecture as a discipline that has played one of the most important roles in society and that has inflected politically, ideologically, and socially all the changes and events that have marked the course of our lifetimes. With this project I intended to participate, from the perspective of traditional architecture, in an artistic endeavor with a wider conceptual base that could implicate the urban and public spaces of the city. A part of the work was produced in Havana (the maquettes, drawings, and multimedia elements), and the photographic component was produced in New York, although all the images were taken in Havana. Despite its being a work that focuses on a local issue, which is the situation of Cuban architecture in the last 25 years, I think it has a much larger and universal scope: the phenomenon of modernity in its incompleteness and the correlating frustration and decay of 20th century utopias and social dreams; the rethinking of the urban environment as a necessity for human beings; imagination as a substitute for reality; and the indictment, from the realm of language and fiction, of the hegemonic and totalitarian discourses of history and politics. It is a work conceived for an international audience, an intelligent and reality-questioning one. This work differs from previous projects in terms of my attitude toward using architecture. In this case I have dealt with it in a much more realistic way, with a political awareness and in collaboration with other thinkers and artists. In previous installations I would present myself as an “architect” who, on encountering fragments of ruins while roaming around in Havana, would reinvent the city, a city that, by the way, was almost entirely constructed in the ’60s. Those works aimed at constructing an utopian project for the future amid a city inhabited by frustration, human and urban decay. The fragmentation of the city would become a metaphor for a “possible” physical and ideological reconstruction by means of first-world alternatives related to notions of luxury and comfort foreign to Cuba, at least in the last 40 years. On the one hand I was interested in projecting the absurd and the imagination onto the urban and linguistic fabric of the city. For the new project I returned to my apocryphal architect profession; I wanted to have an impact on Havana. If for a past series of drawings I had taken as my point of departure the physical ruins of buildings constructed between the end of the 19th and beginning of the 20th centuries, now I’ve tried to situate myself in a more recent moment in history. My other drawings started from the end of a specific story (an architectural reality that in many cases was more than a century old); these pieces take off from a ground zero in history, or better yet, from the rhetoric of history, from the thwarting of a political and social project. In this precise moment is where my new project begins, a moment in which reality has done nothing but remain frozen. I’ve always given much importance to the context in which my pieces develop and toward which the work is directed. Somehow they condition my view and the existential universe that is developed in the work. These contexts also determine the pace at which I work. To make a piece in Cuba today, especially if it’s meant to circulate in the international art circuit, implies much effort and incredible juggling skills. Artists—especially Cuban artists—are among those people bringing the most suspicious artifacts, elements, and substances into airports and airplanes. My friends and I have had a lot of fun telling stories about our encounters with customs agents in airports and the tales we have to tell to account for the materials and objects we carry with us. Alongside the humor of these nuisances exists the reality of having to bring difficult and sophisticated materials into Cuba in order to make a piece. In the worst-case scenarios we face a real inability to make or exhibit the work. Ahora juguemos a desaparecer I (Now Let’s Play to Disappear I), 2001, metal table, candles. Installation view, Sonsbeek 9, Arnhem, The Netherlands. Courtesy of the Giuliana and Tomaso Setari Collection, France-Italy. HB What were your research methods and sources for the Documenta piece? A series of new works made up this project; what influenced you the most when making it? Can you share with the readers the meaning of the phrase “continuity of somebody’s architecture”? CG I’ll start with the last question. After the fall of European socialism, many Cuban construction and architectonic projects were halted or abandoned. In Havana, as well as in other Cuban cities, idyllic and nostalgic ruins from the colonial and first republic periods coexist with the ruin of a frustrated political and social project. Unfinished buildings abound, neglected and in a sort of momentary oblivion. The encounter with these buildings produces a strange sensation; the issue is not the ruin of a luminous past but a present of incapacity. We face a never-consummated architecture, impoverished in its lack of conclusion, where ruins are proclaimed before they even get to exist. I call these the Ruins of the Future. The series of photographs, drawings, and maquettes that make up Continuity of Somebody’s Architecture allows for the constructive continuity of many of these abandoned sites. In this manner, I “intervene” in the initial stage, in which architects traced the plans of these buildings; this constitutes a “mediation” in these architects’ thinking processes. The intervention consists of a series of clear and precise plans to complete the unfinished architecture. Regarding my methods and sources, I can say that initially I documented many Microbrigade buildings that were in the aforementioned unfinished state. Many of these images appear in my work, and especially in the series Continuity of Somebody’s Architecture . Afterward I devoted myself to the search for these buildings’ original plans in order to find out what each architect had intended. In the third stage of this process, with the collaboration of the architect Alberto Suárez, I conceived the final buildings, which were later shown in Documenta 11 thanks to the help of professionals who build maquettes. However, since 1993, when I made the work Aquí construye , I had been interested in the same issues that the Kassel piece addresses. Early on in my career I started thinking about these ideas, and now they’ve materialized in a finished piece. For a long time I’ve acknowledged the influence of those artists who have dealt with architecture and public interventions in urban spaces, such as Félix González-Torres and Krzysztof Wodiczko. I’m also interested in the work of architects such as Frank Gehry and Santiago Calatrava and in a few texts by Rem Koolhaas. HB Cuba hasn’t had any representation in Documenta for some time, but this year both you and Tania Bruguera were invited. Can you explain the inclusion now? CG First, I think it’s thanks to the broad range of vision that Okwui Enwezor, the artistic director, and his curatorial team demonstrated in their approach to Documenta 11. It was a truly global view of contemporary art today. It is impossible to understand the contemporary world’s economic, political, and cultural structure if one doesn’t understand the discourses that the art from peripheral countries is bringing forth. The cultural discourses generated in the so-called third world—or the south, for another example—have been redefining the symbolic projections of the mainstream, or the countries of the north, for a while now. We are not dealing anymore with the dialectic proposed two decades ago in which we approached the “other” or the “margins” as if they were remote, exotic, and distant beings. The “other” now shares experiences similar to “oneself,” has access to the same information and Internet Explorer that “we” all do, and yet, despite all this, is still a bearer of a specific cultural brand, of a series of needs and concerns not yet resolved. Carlos Garaicoa, La ciudad vista desde la mesa de casa (City View from the Table of My House), 1998–2000, color photograph. Courtesy of the artist and Lombard-Freid Fine Arts. HB You used fiction and the invention of urban space in the work. How does writing relate to the various formats that you work in, such as drawing, photography and installation? CG Writing plays a very important role in my work. Before I tried my luck at being a visual artist, I devoted some of my time—although not enough—to writing. From my childhood on, thanks to my father, books have been revered at home. Somehow this interest and obsession have returned over and over and permeated all my work. Words are always present in my pieces; they can appear in the titles of works (where they are essential), in the texts accompanying my installations, in the critical essays of my catalogues and even in the works themselves as language play. There’s a search for narrativity in most of my works: they are always linked to a story that I intend to tell, be it about a place, a person, a city, a particular object, or event. Often my projects are conceived first as text, and this is why I think that the rest of media I use (photography, video, sculpture, and installation) can change and even be substituted. The only unchanging thing would be the anecdote from which sprang forth the work in question, made of a series of visual elements. HB You mentioned Cuba’s Social Micro-brigade; what is it and how does it influence this project? CG The Social Microbrigade is the urban and architectonic phenomenon that has had the most significant impact on the country in the last 30 years. During socialism in Cuba, architecture, as well as social projects, has had a contingent character. The Microbrigade developed from an idea Castro mentioned in a speech in 1970. A housing deficit was afflicting the country, and his idea was that those in need of housing could join a construction brigade and build their own houses. Because of the fall of European socialism, many projects and constructions have been abandoned for over 12 years, thus paving the way for the new genealogy of abandoned ruins I mentioned earlier. This social and visual panorama has been the platform of my projects and has influenced my views on how one can win over realityfrom the realm of the imagination, turning human and social frustration into a victory in the realm of dreams, but real and possible dreams. HB Where were the photographs taken, at fictitious places or real architectural sites? Can you elaborate on the notion of utopia and what it means to Cuba? Can you also address your obsession with cities and your interest in generating work that uses the city as a focal point? CG The photographs were taken in Havana, in real architectural sites. They are Microbrigade buildings whose construction was halted and abandoned for economic reasons. Regarding the notion of utopia, I would like to define the context of the piece shown in Documenta 11 in opposition to it. I think the term has been abused, especially in the worlds of contemporary art and architecture, where there seems to be an urgent desire to catalog as a utopia anything an artist does in the context of art that takes its point of departure from the discourse of architecture. It’s almost impossible to embark on a project or a reflection concerning architecture and the city without the term “utopia” appearing. In the specific case of these works and the context that they remit us to, Cuba, it is expected that what they manifest about the incompleteness of a social project, the broken promises of a system and the historical objectives of an ideology makes one think of utopia at every second. I’d like to make clear, however, that the underlying assumptions and the conceptual mechanisms of this project do not seek to ramify the tired propositions of the “incomplete dream,” of the “country in which we’d like to live,” but rather seek to be viable solutions to a particular reality. Despite the utopian charge of the socialist project, and specifically of the dreams that arose from the practical development of the socialist society, I would like my work in Documenta 11 to be understood not as a dream for the future but rather as an immediate action on reality—a lucid and conscious gesture concerning the collapsed present and the urban and political fabric of contemporary society. I don’t think my works should be seen as impossible dreams; rather they are the result of a profoundly aware and critical reflection on my surrounding reality. They are gestures that point to and somehow want to solve and give continuity to projects that were never fully developed due to the state’s political and economic circumstances. I want to respond to history and the path traced by politics from the realm of thought and the imagination. For many years I thought about how I’d build a maquette of the city. As I was making architectural drawings, and after having completed a series of works in public spaces based on actual buildings and photographs, the logical step that followed was making a maquette of the city. I didn’t want it to be conventional, however. For the 1998 São Paulo Bienal I made the installation City View from the Table of My House , which tried to address the issue of public versus private space. It was a display of domestic crystal objects—bottles, salt shakers, lamps, and a small fishbowl that contained a fighting fish—on an elongated wooden table. All these pieces could turn into a sort of cityscape, a small city at hand where we could change the location of buildings according to our whim, where we could play at being God. It was the city as a labyrinth and a playground where we could make our imagination become real, where we could leap from fiction to reality and vice versa. In a series of later works, New Architectures , 2000, I used Japanese lamps to project a nocturnal city. In more recent ones such as Now Let’s Play to Disappear , 2001, I’ve created wax cities that slowly consume themselves and disappear, as a response to the progressive violence that contemporary cities have to endure. For my Documenta 11 project I decided to make maquettes in the traditional sense, using architectural resources with the aid of architects and maquette makers. Frank Lloyd Wright and the Falling Water House (detail), 1999, color photograph and engraved marble slab, 47¼ x 47¼”. Courtesy of the artist and Lombard-Freid Fine Arts. HB Were you formally trained in art or architecture? What is the art education system like in Cuba? In your early work, you’ve described your process as “interventions”; what do you mean by this, and how does this fit into artmaking? CG I didn’t study architecture; my academic training was in the visual arts. I became interested in architecture while I was studying art, although I had been interested as a child. The programs at the Instituto Superior de Arte (ISA) in Cuba are quite open, so I could approach any field I was interested in. They are closer to open studio programs than to traditional academies; hence the diversity and plural nature of the work that comes out of Cuban art schools. The ideas in my work, although they imply architecture and its uses, also present a debate that is inherent to the discourse and critical theory of the visual arts. Analysis within the theoretical frame of contemporary architecture is truly foreign to me. However, as an active observer of architecture, I don’t think that its main issues are too far away from the debates on visuality and symbolic production that take place in the contemporary art world. HB Can you explain some of the new pieces? I was particularly intrigued by Campus or the Babel of Knowledge . What is the basis for this work? How does this fit into the idea of utopia? CG This piece intends to comment on societies and controlling states. It imagines the circulation of knowledge and learning in a “future” or contemporary society as happening in a solitary, terrible and centralized place. A place for the achievement of a supreme state of knowledge would be possible only if the individual made an effort to escape his circumstances, not the physical ones but the spiritual ones. Reaching knowledge would lead us only to discover our more human face and our need to discover interpersonal relations. This knowledge would work solely as a tool for the awareness and understanding of others. However, in order to achieve it one would have to suffer censorship, loneliness, confinement, and even flagellation. Campus or the Babel of Knowledge is the addition of the experiences that human beings have been subjected to throughout time. It imagines the structure and search for knowledge as taking place in a monastic cloister, almost a medieval one, at the same time that it repeats the well-known shape of the panopticon discussed so much by Michel Foucault. It is the reversal of the labyrinth and the Borgesian library, a tower, like that of Babel, but with a more human God, with its reverse side of knowledge, or its insipidness. It is an anti-utopian building, because it’s already been and returned from the moment of social dreams. The origin of the piece is the notion of the failure of reality; the piece is the result of the lack of faith and beliefs so prevalent in contemporary society. Campus o la babel conocimiento (Campus or the Babel of Knowledge) (detail), 2002, installation with two pencil-and-ink drawings on paper and model in wood and clay with photographs. Courtesy of the artist and Lombard-Freid Fine Arts. HB Your art has evolved a lot since we first worked on a project together for Art in General, in 1996. Where will you go next? What are your upcoming projects? CG In the last ten years my work has evolved from the rhetoric of public art (understood as communicative experiences of the diverse modes of the city) to a constant use of the city and its fragments as a leitmotif. In terms of my production, there has been an increasingly closer relationship with the discourse of architecture. My view of architecture has been evolving to what I produced for Documenta 11, where the border between artistic experience and architectonic experimentation became blurred and ever more tenuous. I will keep developing some of the ideas I was working on before Documenta. I never have specific plans about what I’ll be working on; artistic creation has its own set of rules. I take it day by day, taking advantage of what happens without my expecting it. As of now I’m preparing a solo show for the Maison Européene de la Photographie in Paris, one for the Casa de América in Madrid and another that will take place in the Fundación “la Caixa” in Barcelona in 2003. HB Will Cuba remain a focus in your art? What do you see as the future for Cuba’s ideas on architecture? What is your vision? CG For over five years my work has been focusing on phenomena pertaining to a Cuban context, its cities and social expectations. But at the same time it also attempts to trace broad paths, so my thoughts are able to circulate and encounter the ideal spectator, the global spectator. I’m afraid of works that address local or national problems that can be of no interest to anyone outside that realm. The profession of architect, as much as any other profession related to symbolic production, is affected and limited by economic and political circumstances. The search for solutions within the field of architecture to the key problems of our contemporary world are also discussed, and will continue to be discussed, in Cuba. Among these problems are those of overpopulation and housing in cities, as well as urban development and its sustainability. Architecture faces a double nature in contemporary societies that in my opinion has become intensified in the last years: Does architecture need to respond to social and demographic phenomena of the current world, or does it simply need to focus on validating its own language? To what extent does an architect need to continue with her social function or to develop, according to her own interests, new standards in the architectural language of her historical moment? All these questions are in need of answers in Cuba, where many cities somehow have an old soul accompanied by a youthful desire to embark on, beginning in its streets and buildings, new trends, dialogues and solutions. Translated from the Spanish by Mónica de la Torre. —Holly Block is executive director of Art in General, a nonprofit arts organization located in New York. She has curated numerous international exhibitions of contemporary art, organized artist residency programs, and written many articles and catalogue essays. 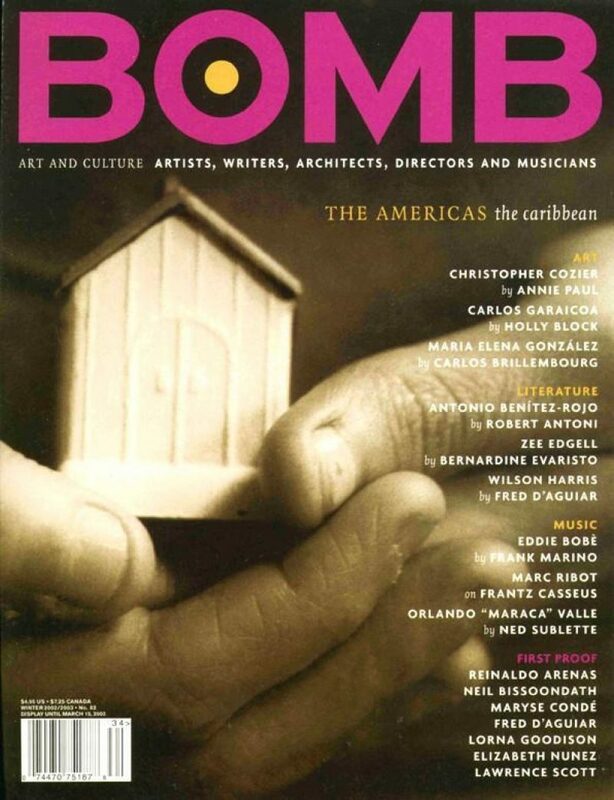 Block is coeditor (with Gerardo Mosquera) of Art Cuba: The New Generation (Harry N. Abrams, Inc., 2001), a comprehensive look at the work of more than 60 artists living in Cuba today. Born in Rosario, Argentina, in 1956, Graciela Sacco is both a distinguished professor of theoretical issues in 20th century Latin-American art and an artist who has literally worked in the streets.